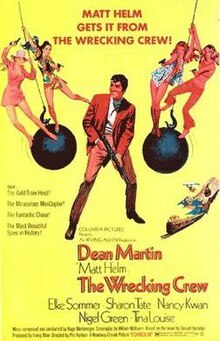 The Wrecking Crew is a 1969 American comedy spy-fi film starring Dean Martin as Matt Helm, along with Elke Sommer, Nancy Kwan, Tina Louise, and Sharon Tate. It is the fourth and final film in the Matt Helm series, and is very loosely based upon the 1960 novel of the same name by Donald Hamilton. Chuck Norris makes his film debut in a small role. Matt Helm is assigned by his secret agency, ICE, to bring down an evil count named Contini, who is trying to collapse the world economy by stealing a billion dollars in gold. Helm travels to Denmark, where he is given a guide, Freya Carlson, a beautiful but bumbling woman from a Danish tourism bureau. A pair of Contini's accomplices, the seductive Linka Karensky and Yu-Rang, each attempt to foil Helm's plans. The former is killed in an ambush intended for Helm, the latter in an explosion. On each occasion, Freya's clumsy attempts to assist Matt are helpful, but not particularly appreciated. McDonald, his chief at ICE, turns up to aid Helm, but is wounded in action. McDonald confides to Helm that the seemingly inept Freya is actually a top secret British agent herself, using a clever guise. They go to Contini's chateau for a showdown, and Helm creates chaos and destruction with a variety of unique gadgets. Contini escapes with the gold on a train bound for Luxembourg, but with a minihelicopter, Helm and Freya are able to catch up to him. Freya almost gets killed by Contini, but Helm rescues her, then kills Contini by throwing him through a trap door onto the railroad tracks. Successful and alone at last, Helm finally has an opportunity to thank an appreciative Freya as only he can. The film featured a number of wrestlers, boxers, and karate experts in small or uncredited roles, including Wilhelm von Homburg, Pepper Martin, Joe Gray, Joe Lewis, Ed Parker and – in his first ever screen role – future star Chuck Norris (background player in the House of 7 Joys scene). Bruce Lee does not appear in the film, but receives a production credit as 'Karate Advisor' (choreographer) for the fight scenes. The film is the first in the series to not be written or co-written by regular screenwriter Herbert Baker, who was working on Irving Allen's more serious spy film Hammerhead. The film was written by former police reporter and crime novel author William P. McGivern. Helm's chief at 'ICE', MacDonald, is John Larch in this film, replacing James Gregory, who played the role in the other three films. Gregory said in an interview in Filmfax magazine that he was sent a reduced amount for his fee in the film. He was told that the film was reducing its budget, and Gregory refused to take the lower fee. This is the only film in the series not to feature Helm's secretary, Lovey Kravesit, played by Beverly Adams, who was also appearing in Hammerhead. Hugo Montenegro composed the score and Mack David and Frank DeVol wrote the theme song played over the opening and end credits, "House of Seven Joys", which was the working title of the film. Critical response to this film varied, with some calling it the worst of the series. It mostly features Helm playing up to glamorous women, and the storyline is merely the bits that join those many encounters together. Also some acting was poor, and the film had many minor mistakes in it which should have been edited out, as well as so-so special effects. Others called it the best, due to its reduced reliance on outlandish gadgets and story lines. It is also notable for the appearance of Tate and martial arts scenes choreographed by Lee. The film ends with the announcement of a fifth Matt Helm film, The Ravagers (which would have been based upon Hamilton's 1964 novel of the same title). However, Dean Martin declined to return for another film in the face of a declining box office. When Martin refused to make The Ravagers, Columbia held up Martin's share of the profits on Murderers' Row. The project was then cancelled. A "Tony Rome Meets Matt Helm" movie with Frank Sinatra reprising the character he had played in the films Tony Rome (1967) and Lady in Cement was also bandied about, but never amounted to anything. Several years later, a Matt Helm TV series featuring Tony Franciosa was attempted, but it had nothing to do with the movies, and it was unsuccessful. As of 2009, early planning for a new Matt Helm-based film was underway through DreamWorks. This page was last edited on 9 February 2019, at 03:50 (UTC).